George Adelbert "Bart" Bartholomew was an American biologist who helped establish the modern fields of comparative animal physiological ecology and behavioral physiology, and gained international renown. He strongly advocated that studies of organisms should be made both with field investigations as well as in the laboratory. Bartholomew was a pioneer in the study of desert organisms. Born 1 Jun 1907; died 8 Aug 1996 at age 89. Born 1 Jun 1905; died 26 Feb 1997 at age 91. Italian research veterinarian who developed an effective, safe, and reproducible vaccine against anthrax that succeeded in virtually eliminating the disease. Bacillus anthracis is a very large, Gram positive, sporeforming rod. The Sterne Strain of Bacillus anthracis produces sublethal amounts of the toxin that induce formation of protective antibody. Born 1 Jun 1866; died 18 Feb 1944 at age 77. Born 1 Jun 1863; died 16 Dec 1916 at age 53. German-American psychologist and philosopher who was interested in the applications of psychology to law, business, industry, medicine, teaching, and sociology. He was a forerunner in the field of behaviorism: in theoretical psychology, his “action theory” defined attention in terms of the openness of the nerve paths to the muscles of adjustment. His work in industrial/organizational (I/O) psychology was extremely experimentally based. He looked at problems with monotony, attention and fatigue, physical and social influences on the working power, the effects of advertising, and the future development of economic psychology. He also looked at the reliability of eye witness testimonies. Psychology and Industrial Efficiency, by Hugo Münsterberg. - book suggestion. Born 1 Jun 1849; died 2 Oct 1940 at age 91. Born 1 Jun 1843; died 19 Mar 1930 at age 86. Born 1 Jun 1675; died 11 Feb 1755 at age 79. English inventor of the hovercraft. He was an electronics engineer with the Marconi Company (1935-50) where he worked on airborne navigational equipment and on radar. Then he began a boat-hire business. Considering the water drag on the hull of a boat, he had the idea of raising the boat on a cushion of air. In 1954, he performed a crucial experiment using kitchen scales, tin cans, and a vacuum cleaner to show that a stream of air could produce the required lift. The next year he built a working balsa wood model with a model-aircraft engine. The first full-scale prototype, SR-N1, weighed 7 tons and was capable of 60 knots. It crossed the English Channel in 1959 (with Cockerell aboard). Hovercraft entered regular cross-channel service in 1968. Died 1 Jun 1979 at age 74 (born 29 Aug 1904). German surgeon who shared (with André F. Cournand and Dickinson W. Richards) the Nobel Prize for Physiology or Medicine in 1956 for the development of cardiac catheterization. This is a procedure in which a tube is inserted into a vein at the elbow and passed through the vein into the right atrium of the heart. Drugs can thus be passed into the heart. In 1929, while a young surgical resident in a small German hospital in Eberswalde, Forssmann proposed introducing a catheter as an alternative to avoid dangers with the direct injection of drugs into the heart frequently demanded in an emergency. It was believed at the time that any entry into the heart would be fatal. Nevertheless, after practice on cadavers, Forssman experimented on himself. He anesthetized his own elbow, inserted a 65-cm catheter in his antecubital vein. Then walked with catheter dangling from his arm, along several flights of stairs to the x-ray department where he calmly documented the position of the tip of the catheter in the right atrium of his heart. Without pain or discomfort, he had proved that a catheter could be inserted safely into a human heart.Various biographical sources (including the Nobel Prize) give date of birth as 29 Aug; Enc. Brit. gives 20 Aug.
Mavericks, Miracles, and Medicine: The Pioneers Who Risked Their Lives..., by Julie M. Fenster. - book suggestion. Died 1 Jun 1941 at age 68 (born 21 May 1873). German psychiatrist who recorded the first human electroencephalogram (EEG). In 1929, he devised a system of electrodes which he attached to his son's skull, and connected to an oscillograph. This gave a recording of brain waves - the rhythmic changes in electric potentials. The most prominent of these rhythms he labelled "alpha waves" and "beta waves." Daniel Hudson Burnham was an American architect, raised and educated in Chicago, who gained his early architectural experience with William Le Baron Jenney, the so-called "father of the skyscraper". With John Root (1850-91), he pioneered the construction methods which made modern skyscrapers possible. He designed the dramatic Flatiron Building in New York City. Burnham also gained his reputation as a city planner. In 1909, Burnham and his assistant Edward H. Bennett prepared The Plan for Chicago, which is considered the nation's first example of a comprehensive planning document. Died 1 Jun 1867 at age 69 (born 24 Jan 1798). German mathematician who developed the first complete theory of imaginary points, lines, and planes in projective geometry. His early work was on determining the orbit of a comet and, based on this work, he received his doctorate. He showed how to construct a regular inscribed polygon of 17 sides using only compasses. He turned to projective geometry and Bernoulli numbers (discovered by Jacob Bernoulli). An important work on projective geometry, Geometrie der Lage was published in 1847. It was the first work to completely free projective geometry from any metrical basis. He also gave a geometric solution to quadratic equations. French mineralogist who was the founder of the science of crystallography through his discovery of the geometrical law of crystallization. In 1781, he saw an accidentally dropped calcite crystal broke into rhombohedral pieces. Deliberately breaking various forms of calcite, he found the same result. He concluded that all the molecules of calcite have the same form and it is only how they are joined together that produces different gross structures. Hence, he suggested that other minerals should show different basic forms. He thought that there were, in fact, six different primitive forms from which all crystals could be derived by being linked in different ways. His theory was able to predict in many cases the correct angles of a crystal face. Light Pollution, by Bob Mizon. - book suggestion. In 1992, the E-Lamp, an electronic electrodeless 20-year lightbulb, was announced by Pierre Villere. The E-Lamp is illuminated when radio waves excite a phosphor coating, an efficient process that can save as much as 75% of lighting costs. The E-lamp technology was licensed from Diablo Research Corporation that developed it in the late 1980s. However, they were not approved for residential use in the U.S. In Apr 1994, General Electric (G.E.) Lighting announced that "the world's first practical compact high-tech induction reflector lamp" would be on the market in Europe within weeks using the tradename Genura. It is smaller than the incandescent reflector lamp it replaces. In 1965, Arno Penzias and Robert Woodrow Wilson detected a 3 degree kelvin primordial background radiation using a horn reflector antenna built for radio astronomy. The Big Bang description of the origin of the universe took place 15 to 20 billion years ago in an explosion from a hot dense state. The high energy radiation produced when the universe was very young and very hot would have been absorbed and degraded as the universe expanded and cooled. The microwave background radiation first observed by Penzias and Wilson is thought to be a relic of this very early state, when the universe was only about a million years old. The uniformity of microwave background indicates that the universe was homogeneous until it was a few million years old. In 1955, a solar energy battery was first shipped from an American commercial factory, National Fabricated Products, Inc., Chicago, Ill. The battery was disc shaped, about the size of a half-dollar, with two terminals. It was hermetically sealed, and provided about half of a volt of electricity. In 1951, a titanium plant was opened in Henderson, Nev. which was the first fully self-contained and integrated facility in the U.S. It converted titanium ore into titanium sponge, which was melted down and formed into ingots of titanium metal. In 1947, the development of photosensitive glass was announced publicly in Corning, N.Y. It had first been made by the Corning Glass Works in Nov 1937. The glass is crystal clear, but exposure to ultraviolet light followed by heat treatment forms submicroscopic metal particles creating an image within the glass. This is believed to be the most durable form of photographic medium, and to be as permanent as the glass itself. In 1946, television licences were first issued in Britain costing £2 and included radio (radio-only licences then cost £1) and were sold at Post Offices. Television services had been suspended suspended during WW II. A Mickey Mouse cartoon was being shown when TV service was suddenly blacked out for defence reasons on 1 Sep 1939. That same cartoon was shown on 8 Jun 1946 when television re-opened to cover the Victory Parade. The first radio licence fee began in Nov 1922 and cost 10 shillings (50p). The BBC's domestic radio and TV services are financed by the television licence fee, which continues to the present time. The licence fees as of 1 Apr 2002 are £112.00 for colour and £37.50 for black and white. In 1920, Thomas A. Edision received a patent for "Composition of Matter for Sound-Records or the Like and Process" (U.S. No. 1,342,326). In 1909, Thomas A. Edison received a patent for “Shaft-Coupling” (U.S. No. 923,633). In 1886, black American inventor W.H. Richardson was issued a patent for a "Cotton Chopper" (U.S. No. 343,140). 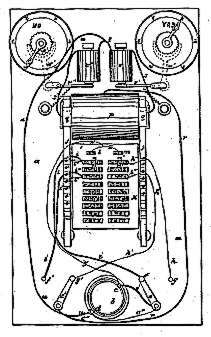 In 1886, Thomas A. Edison was issued a patent for a "System of Electrical Distribution" (U.S. No. 343,017). In 1880, Thomas A. Edison was issued a patent on a design for a “Magnetic Ore-Separator” (U.S. No. 228,329). In 1875, black American inventor Alexander P. Ashbourne received a patent for a "Process Preparing Cocoa-nut for Domestic Use" (U.S. No. 163,962). The patent describes the process by taking any quantity of coconuts and pare them. The meat is then grated or otherwise pulverized, and is then passed through fine sieves, hot boiling water being added at the same time. The meat is then cooked with hot steam for 3 to 4 hours, then pressed dry. Sugar is added in the ratio of one pound of sugar to three pounds of coconut, plus a small quantity of fine stick cinnamon to preserve the flavour. The compound is dried gradually and packed. In 1869, Thomas Edison of Boston, Mass., received his first patent. It was for an "electrographic vote recorder." The device was the first of its kind, and would enable a legislator to register a vote either for or against an issue by turning a switch to the right or left. His application was executed on 13 Nov 1868 and submitted to the U.S. Patent Office on 28 Nov 1868 (No. 90646). In 1768, Antoine-Laurent de Lavoisier sat for the first time at the Royal Academy of Sciences. Lavoisier had been on the list of candidates for two years. The death of Théodore Baron had liberated a place at the Academy for a chemist and supported by his father's friends, Maraldi and Duhamel du Monceau as well as by Bernard de Jussieu, Macquer and Joseph Jérome Le François de Lalande (1732-1807), he was elected. His first papers were reports on analysis: studies of gypsum, the diamond, meteorites, charcoal, lead and mineral waters.